WASHINGTON - The United States on Thursday announced tens of millions of dollars of aid to Pakistan, for roads and power plants, as the Obama Administration tries to forge a new relationship with a major ally in the fight against terrorism. The announcements came as two days of high level talks wrapped up in Washington. WASHINGTON — For the first few years after the September 11 attacks, any audio or video-taped message from Osama bin Laden prompted an almost immediate reaction from the U.S. intelligence community, and within a day or two, verification of its authenticity. But as time went by, intelligence and counterterrorism officials decided they were no longer going to give credibility to what they considered the al Qaeda leader's hateful messages. There would be virtually no comment, not even to verify his identity. As one official put it to me at the time, "It has never not been him." However, I would still make the perfunctory call after each new bin Laden tape, knowing full well I would get a "no comment." Amid questions about Iran's involvement with the Taliban in Afghanistan, U.S. Defense Sec. Robert Gates addressed the issue at a Thursday briefing. "Based on everything that I've seen, I continue to believe that the Iranians are involved," Gates said. "But it remains at a relatively low level and we certainly would hope that it stays that way." Earlier this week, U.S. military and intelligence officials said Iran is helping train Taliban fighters within its borders. The United States has already said that the Taliban may be receiving limited training from the Iranians in Afghanistan itself, but officials told CNN that training in the use of small arms was occurring within Iran. Britain's Prince Charles left Afghanistan on Thursday after an unannounced two-day visit there, a spokesman for Clarence House said. 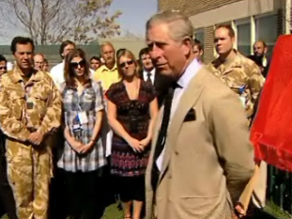 The heir to the British throne spent a night at Camp Bastion, the main British base in Helmand province, before traveling to Lashkar Gah, the capital of the province. He also visited Kabul, the spokesman said. KABUL, Afghanistan - A suicide bomber wearing a vest laden with explosives was killed by locals Thursday in eastern Afghanistan before he was able to detonate, police said. The incident occurred in the Muqur district of Afghanistan's Ghazni province, according to Kheyal Mohammad Sherzai, a police chief in the province. The suicide attacker was from Pakistan's Warizistan area, authorities said. The people who intervened in the incident pelted the man with stones and slashed him with knives and were able to kill the man and give the suicide vest to police. - Journalist Matiullah Mati contributed to this report.